After mid-terms, I went back to the leftover pieces from the "Sun Juicer". You can view its finished form in the pictures. As far as offering a model for my students, it offers several things: Simplicity, cost effectiveness and weight/ease of use. One thing that I will be working on solving is that it does not seem to throw a beam as focused as the SolSource that I have been working with. 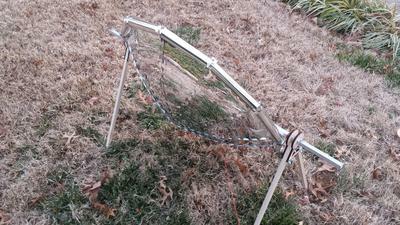 Because the unit is so lightweight (about 1 pound), adjustment is very simple on the Sun Juicer. 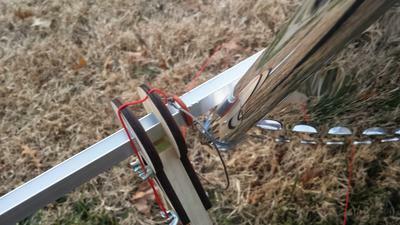 Rotation about the X-axis is done through a simple string set-up. Y-axis rotation is done simply by picking the unit up and turning it towards the sun. The collecting surface is much smaller than the SolSource, so cooking ability should decrease quite a bit as well. As I was looking for additional information, I came across another solar innovator that I am looking to work with - he also has a Kickstarter project going, so be sure to check him out! 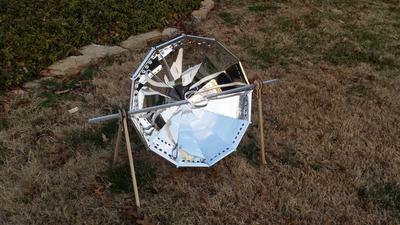 His solar cooker is a variation on the parabolic oven. It is a square parabola, which might be a little more achievable for my 8th graders. I have seen versions of this on Youtube, but much of the focused beam impacts the side of the pot rather than the bottom, making skillet cooking a little tricky. My goal for this break is to look at easy-to-build panel ovens to see if there is something that I can have lower-level students attempt if they feel overwhelmed by solar oven choices. I have a contact near the school who can supply large quantities of square pallet cardboard (4X4ft), so cardboard should be in ready supply...reflective surfaces would be the next hurdle. Thanks for the heads-up Jim! The cardboard should start accumulating a week or two after this break, so that might be a weekend project.